Concerned over exposure to heavy metals from well water or old pipes? Worried that your illness may be caused by excess heavy metals? 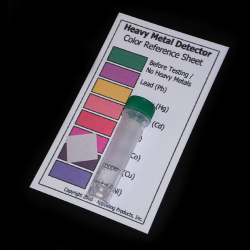 ChemSee now offers detectors which can be used to test the water, foods, liquids, bodily fluids such as urine/saliva and many other types of samples for the presence of heavy metals. 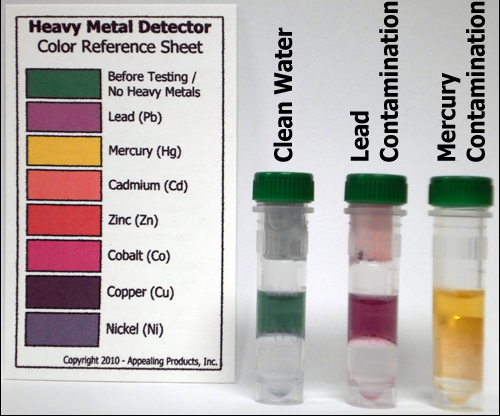 Testing for lead, thallium, mercury, cadmium, cobalt, iron, nickel and zinc can be completed in less than one minute. A reference color chart is provided for interpreting the test results. Simply add your the detection tab to the vial, add your sample, shake for 30 seconds and allow the liquid to separate. Once the liquid has separated into two phases, look at the color formed on the top phase and compare it to the chart.